The tsunami hit at 9.30pm local time with no warning as there had been no earthquake. Many of the dead were enjoying a busy holiday weekend when water crashed ashore, sweeping away hotels and houses. Indonesia frequently falls victim to earthquakes and volcanic eruptions. 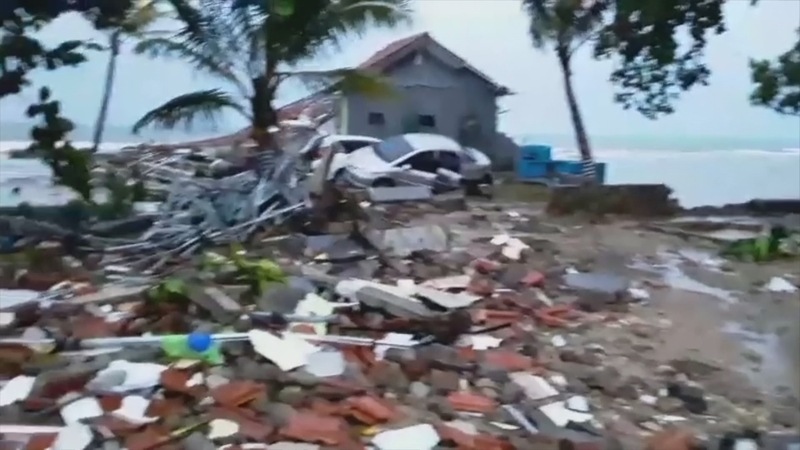 This tsunami hit coastal areas on the Sunda Strait between Java and Sumatra. The volcano Anak Krakatau has been erupting since the summer and scientists believe last night ‘s tsunami may have been caused by underwater landslides beneath the 1,000 foot volcano. We also speak with aid worker Dwi Rahayu who is in Indonesia.